Me at last year’s Rhone Rangers event, just happy to be here. So, for this year’s Rhone Rangers Grand Tasting I went in with a plan. This year I was in search of acidity and I had a list of wineries that I had researched that just might have the brand of Syrah that I was looking for. The previous year had largely been a bust because I hadn’t done my research and I didn’t focus on one variety. I mean, I tasted some great wine but it wasn’t in the style that I was looking for. Many of the wines were big and blocky and even verged on flavors of port wine. These were not the elegant and balanced wines that I so love to drink with food. I left last year’s Rhone Rangers wondering where these wines were. Had a made a great mistake in trying to start a blog about California cool-climate wines? Now, it turned out that with a little more research I found a year’s worth of Syrah to drink without much of a problem. And luckily at the very end of last year’s tasting I did find a couple of wineries that matched my style. Ambyth and Two Shephards were fantastic examples of more balanced versions of the grape I love. Those two successes were enough to bring me back to Rhone Rangers this year and this time I even got to go as a member of the media. Me at this year’s Rhone Rangers event, a man with a plan. Here were some of the standouts that I tasted this year in alphabetical order. You’ll notice that I skipped Ambyth this year having done an earlier blog post (link) about their wines. But first, a word about these types of tastings: I prefer to write about a bottle of wine that I’ve tasted over a period of time, most often over two days. I think this gives me a real sense of what the qualities of the wine are. I hope to spend some more time with wines from the wineries listed below and give a more detailed picture of the winery and the vineyards and people behind it. 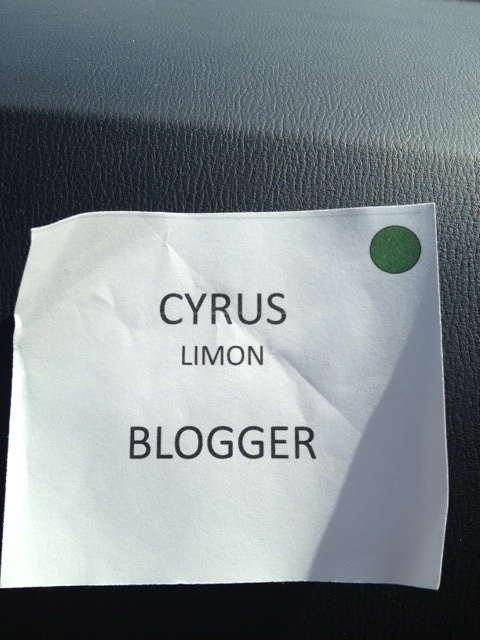 So, what follows is just a snapshot of the highlights of my day. It was a pleasure to finally taste some of Randall Graham’s (THE Rhone Ranger) single vineyard Syrahs. I have been wanting to for a while and always heard that he made a more restrained and elegant style of Syrah, which was exactly what I found to be the case. The nose on the Alamo seemed pretty closed down that day. The wine had great acidity and balance on the palate but was very tight and I didn’t get the aromatics and flavor profiles that I normally get from Syrahs made in this style. The Bien Nacido has a gorgeous floral nose that made me think it had some Viognier in it. It also reminded me a bit of a warmer style Syrah but it was decidedly not jammy. This is a great wine. The body was very restrained and with firm acidity on the finish. Another example of a Pinot-focused producer that also makes great Syrah. Both the 2008 “Heart of Stone” and the 2010 “Stone Soup” wines were brighter styles of Syrah with wonderful savory aromas. The most interesting thing about this producer is that they are in the Sierra Foothills appellation. I look forward to trying more of their Syrahs in the future. 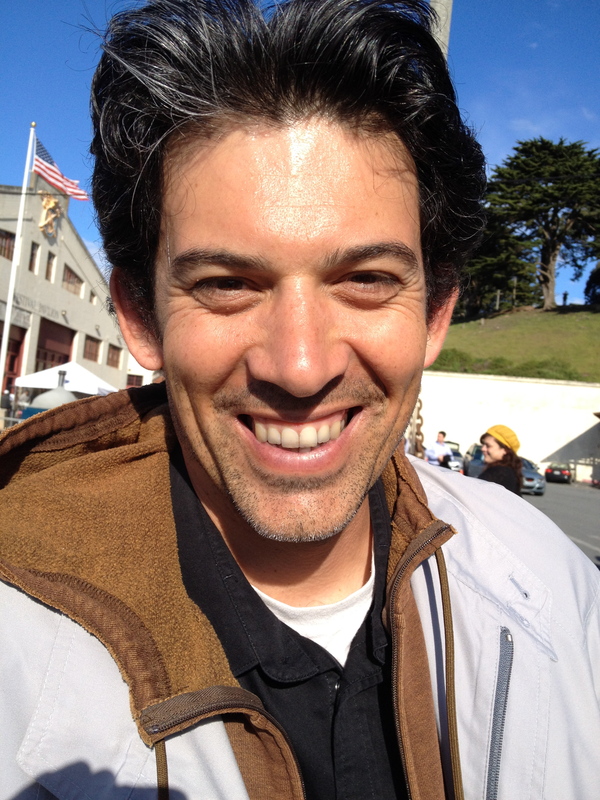 I stopped by the Eric Kent table so I could taste their Las Madres vineyard Carneros Syrah. After I had written about the Anaba version I’ve been keeping my eye out for more wineries making Syrah from this special vineyard. Now, as I mentioned in the Anaba post, this is not exactly a vineyard that produces a wine with a ton of acidity but it does have an amazing aroma profile, there’s a savory meatiness to the wine that’s really tantalizing. These wines didn’t disappoint. The ’11 seemed a bit rounder and the ’10 a tad more angular but those fantastic aromatics were there. Winemaker Steve Law and I had a great time talking about cool-climate Syrah. I’ll definitely have to dedicate a later post to Steve because like myself, he’s a bonafide cool-climate Syrah aficionado. This was my favorite of the bunch. At 12.8% alcohol it was decidedly his most cool-climate in style. 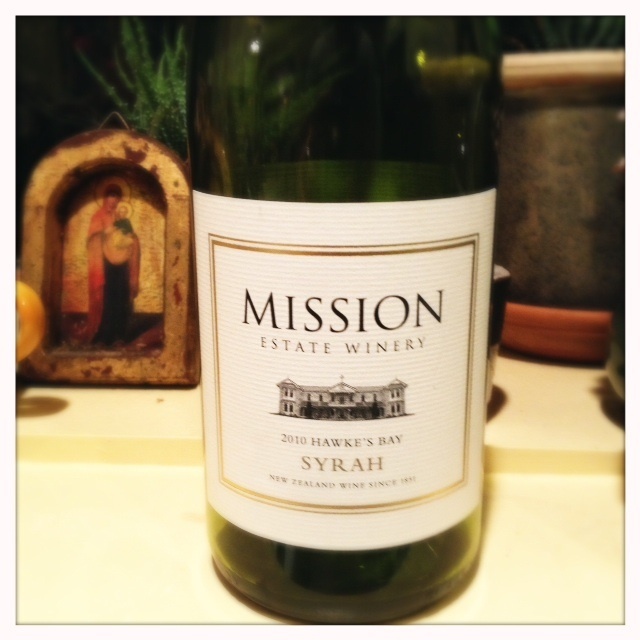 Elegant on the palate, high in acidity and with great savory components, this wine was Steve’s attempt at making a California version of a Saint Joseph. And I think he succeeded. This was Steve’s blend from his different vineyard sources. Also a very balanced wine, nice acidity and not too blowsy. Drouthy Neebor means Thirsty Friend in Scots. This wine is more of a nod to the average California wine consumer. It’s a bit bigger and richer than the others. I liked it but not nearly as much as the previous two wines. A bigger style to be sure but also had good acidity and some savory components. Meyer Family is owned by the family that founded Silver Oak Winery in Napa. The son Matt moved out to Yorkville Highlands with the thought that that small appellation between the cool Anderson Valley and the hotter eastern valleys would be a perfect spot for Syrah. 2009 Syrah Yorkville, $28 and the 2009 Syrah, “High Ground” Yorkville, $42 Both wines had wonderful acidity and a nice clean finish but not a whole lot of aromatics. They seemed a tad closed down to me, I got a bit of black olive aromas and some plum. I’m keeping my eye on this appellation though, I think there’s a ton of potential here for Syrah. Here was a winery that I definitely had not heard of. I was really pleased to taste their 2009 Sonoma Coast Syrah. This wine had great black pepper cool-climate aromas. It was a bit on the richer side but not over-oaked and not over-the-top. I look forward to spending more time with another bottle of this wine. Now this is a winery that needs no introduction for anybody that knows anything about Syrah. Bob Lindquist has been championing a cool-climate style of Syrah for years now and it was fun to taste some of his higher level offerings at Rhone Rangers. His table was a bit crowded and it was hard to find some elbow room to take down any notes but let’s just say that all of the Syrahs that he offered showcased a lot of pepper aromas that I associate with cool-climate Syrahs. They were definitely still California in their body and style, I would say almost a combination of a cooler and warmer Syrah. I enjoyed the wines, and again, will have to spend some more time with them down the road. I stopped to taste Stark’s 2009 Eaglepoint Ranch Syrah because it was a 2006 Eaglepoint Ranch Mendocino Valley Syrah I tasted many years ago that was one of the wines that opened my eyes to cool-climate Syrah. I wanted to check in with Stark wine to taste theirs because for whatever reason they’re simply aren’t many Eaglepoint Syrahs around these days. Stark’s version is a little more on the rich side than I remember but it still had good acidity and some cool-climate characteristics. I was very impressed with Terre Rouge because I have never heard of them before and also because I tend to like Syrah more from coastal areas in California and haven’t had many great examples from the Sierra Foothills. These wines were fantastic. Both the 2008 DTR and the Sentinel Oak Syrahs had great acidity and savory components. Even their most expensive Syrah, the “Ascent” ($85) had a core of acidity that brought out the minerality of the wine. Another interesting aspect of these Syrahs is that they are grown on their own root stock which is a rarity in California wine. I’m very interested to explore more of their wines down the road. Two Shepherds was getting a lot of action on the day of Rhone Rangers so I only had a brief chance to check in with William Allen and taste his 2011 Russian River Syrah. This is a wine that I tasted earlier in the year and was getting a lot of primary fruit aromas. Not many savory or “off fruit” aromas that time around. This is a great wine that’s made to really let the fruit speak and not be overwhelmed by oak. This time around I was getting some more olive and black licorice aromas. I have a bottle of this wine and will be re-visiting it soon. All in all, it was a much more successful day at the Rhone Rangers tasting and left me optimistic about the state of Syrah in California. Perhaps, as many wine writers have been saying, we, as a country, really are moving towards a more “balanced” and food-friendly style of wine. If this is truly the case, I couldn’t be happier and I look forward to tasting them in the years to come. A footnote: Over the past year of writing this blog I’ve been doing a lot of thinking as to how the average consumer can get more information on what style of Syrah they are going to taste. Much in the same way that the In Pursuit of Balance organization has promoted a more acid-driven balanced version of Pinot Noir, Syrah would benefit from some way for the consumer to differentiate its varied styles. If I had more money and time I would try to promote this organization but in the meantime if you also share the same love of the savory side of Syrah, keep reading my blog. 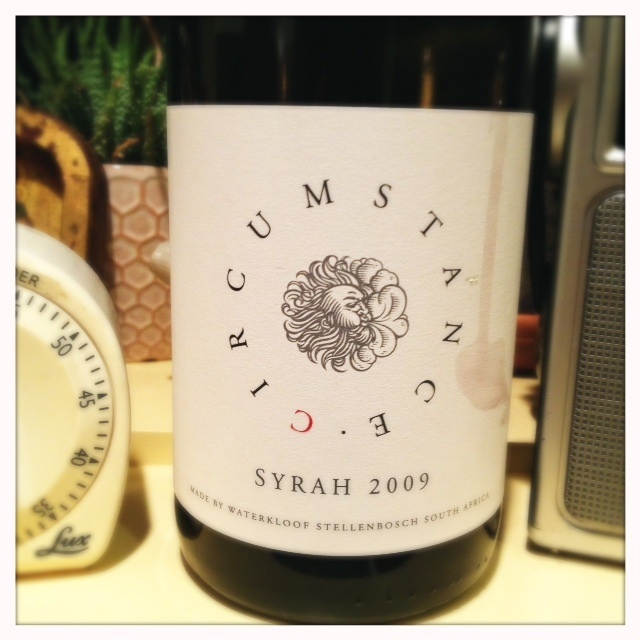 To be sure, South Africa is simply not on my radar as a place from which to enjoy Syrah. I think of Chenin Blanc, I think of Pinotage and I think of Cabernet. But a fellow Syrah aficionado convinced me that this was the real deal. The nose on this wine just screams Syrah. It’s a combination of smoky and savory components like olive tapenade and smoked wood mixed with blackberry aromas. There’s also just the slightest hint of a vegetal aroma. Which is exactly what I like. The mid-palate has good texture and richness. The finish, although a tad too sweet for my taste, does have a fair amount of acidity. It’s a wine fit for gulping but with just the right amount of complexity to encourage you to linger over it for a bit. It’s a tad New World in style but without much alcohol coming through and any of that blocky sweetness that you can get on Syrahs that are too over the top. The Waterkloof story is a fascinating one. It’s a biodynamic vineyard and a place that is attempting to create an environmentally sound ethos as a winery. You can watch an amazing video of all that’s going on there. Let me just tease it by saying that it includes Rastafarian Horse Shepherds. The biodynamic/organic story is one that’s been told in many places and I don’t want to belabor it here. Let’s just say that the Waterkloof owners believe that minimal intervention results in wines that more truly represent the terroir from which they come. They believe that most of the intervention should come in the vineyard and actually the majority of the focus should be in the soil, not in the vines. This is a pretty standard story for a biodynamic vineyard. Does is make better wine? The truth is I’m not sure, but this wine does have a texture and complexity that I don’t often get in many New World Syrahs. Does that have more to do with the biodynamic nature of the vineyards or the fact that the grapes were fermented with their stems in large basket presses and then aged in larger 600 liter oak barrels? Again, I’m not sure. And to be honest this is what I love about wine. There’s an unsolvable complexity to it that keeps me interested. It’s an intellectual and physical experience all rolled into one. So I’ve wanted to write about this wine for a while. And, in fact, it’s one of the reasons I decided to open up the blog to wines from places outside of the U.S. I’ve been looking for a Syrah like this — one that has cool-climate characteristics yet with a modest price tag. I tasted this blind in a large group of Syrahs and guessed it to be French. Now, I didn’t peg it for an expensive French Syrah but I did think that the combination of dryness and clarity on the palate made it French. I was obviously surprised to see that it was from New Zealand and only $13 and I’ve been buying it for a while since then. On the nose this wine really tells you it’s a Syrah. There is no oak to mask the aromas, just pure red berry, smoke, and pepper aromas. It has a light and elegant nose and no hints of alcohol and, in fact, this wine comes in at a low 12.5% alcohol. It’s got tons of flavor and a nice acidic lift on the mid-palate. A very food-friendly wine — I’m thinking pork or roast chicken. I would suggest decanting it or opening it and letting it sit for a bit to mellow out some of that acidity because it can be a little harsh on first opening. In fact, this wine was much better on the second day. The Mission Estate Winery is one of the older wineries in New Zealand. The grapes for this Syrah are grown in the famed Gimblett Gravels area of Hawkes Bay, which is mostly known for its Bordeaux varieties (Cabernet Sauvignon, Merlot etc. ), but is also known for some spectacular Syrah. There isn’t much of it, but the few examples I’ve had in addition to this wine show that great things can be done with Syrah there. The defining characteristic of the Gimblett Gravels terroir is, as you can gather from the name, the gravel. The rocky soil means that there’s little water retention and the vines struggle to grow and have a tendency to focus their efforts into producing concentrated fruit. The other interesting aspect of this area is that it’s virtually impossible to grow grapes in the Gimblett Gravels without using irrigation. For many winemakers and consumers, irrigation is a bad word. They will tell you that wines that are irrigated are not truly representative of the environment in which they are grown because the addition of water masks their authenticity. Well, here’s an area of the world in which wine would not exist if it weren’t for this judicious addition of water. And the wines are ridiculously good. To allow the purity of that Gimblett Gravels fruit to come through, the wine is aged in stainless steel tanks, which could account for a bit of the rather rustic mid-palate since there is no oak aging to mellow it out. This is a great wine for 13 bucks. You might be more likely to find the 2011 now but from what I’ve heard the vintages are very similar.